Celebrate the last night of the year with the entire family and raise a toast at the San Mateo Marriott Hotel with our 16th annual New Year's Eve Party. "New Year International Extravaganza 2019" San Francisco biggest New Year's Eve Party 2018. DRESS CODE ENFORCED (Cocktail Attire) NO EXCEPTIONS. Room #4: 80's, 90's and Top 40's.- Twins Ramos singing all the 80's, 90's and Top 40's hits. Shows, dancers, carnival performances with Amor Do Samba entertainment! Rooms starting at $195 includes free breakfast for 2. 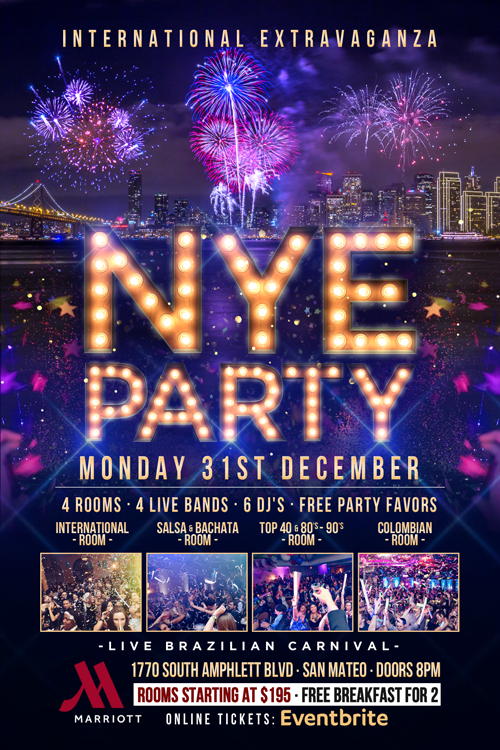 Promo code "New Year's Party"
1770 S Amphlett Blvd, San Mateo, CA 94402.